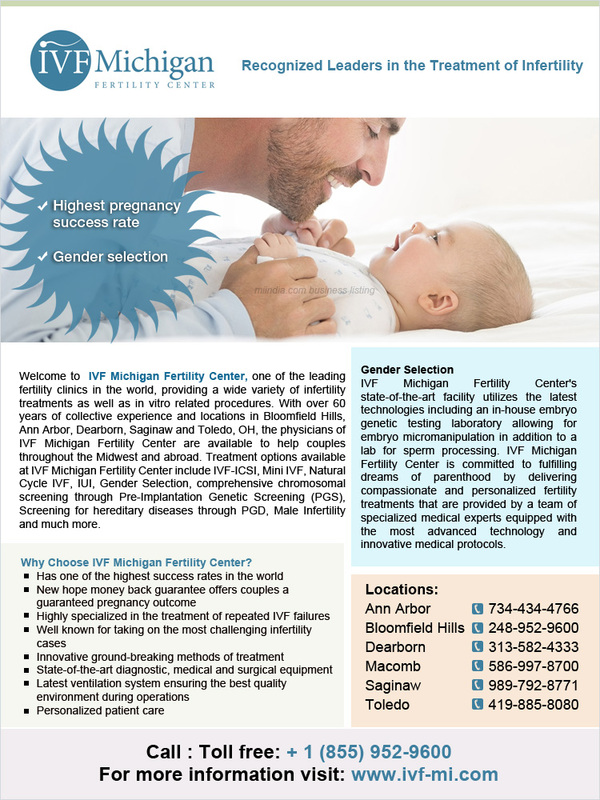 Welcome to  IVF Michigan Fertility Center, one of the leading fertility clinics in the world, providing a wide variety of infertility treatments as well as in vitro related procedures. With over 60 years of collective experience and locations in Bloomfield Hills, Ann Arbor, Dearborn, Saginaw and Toledo, OH, the physicians of IVF Michigan Fertility Center are available to help couples throughout the Midwest and abroad. Treatment options available at IVF Michigan Fertility Center include IVF-ICSI, Mini IVF, Natural Cycle IVF, IUI, Gender Selection, comprehensive chromosomal screening through Pre-Implantation Genetic Screening (PGS), Screening for hereditary diseases through PGD, Male Infertility and much more.